I had a delightful and relaxing American Thanksgiving weekend where I did not think about programming languages hardly at all. My general plan for the weekend was to (1) roast a turkey to feed 19, (2) make soup from the bones, and (3) do jigsaw puzzles with friends while eating soup. 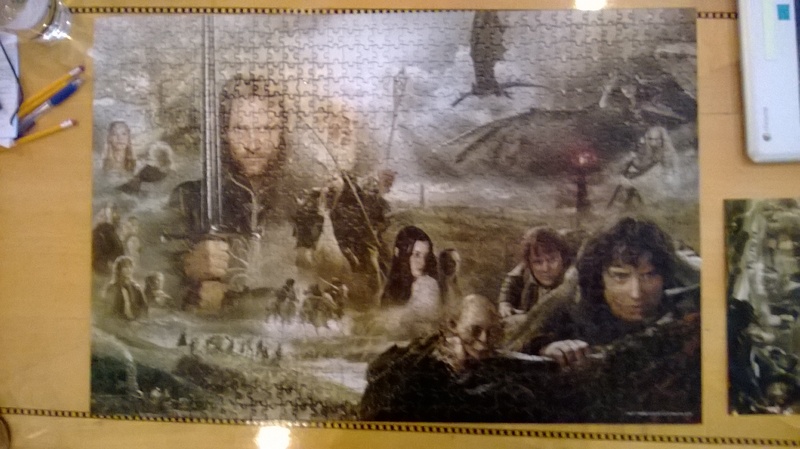 Many thanks to my crew of helpful friends who did most of the work putting Aragorn together. 1) Brine the turkey for 12+ hours in a clean, food-safe five-gallon bucket with eight litres of water, half a kilogram of salt and two bottles of the cheapest chardonnay you can find. 2) Carefully follow the instructions in the Joy of Cooking. That is, truss the bird, roast it upside down at 325F for the first half, then flip it to roast breast side up for the second half. This solves the problem of undercooked legs and overcooked breast. Increase the temperature at the end, and measure the temperature inside the thigh. I find that going all the way to 175F is unnecessary; I’ve never had a problem with undercooked legs after the thigh gets to the mid to high 160’s. I stuff the cavities with apples and have someone else make the bread stuffing separately. Next time on FAIC: Back to C# with another look at the method type inference algorithm. This entry was posted in Non-computer and tagged Tolkien, turkey by ericlippert. Bookmark the permalink. Absolutely. Carry over can easily get you 5 more degrees after you pull your food from the oven even on small dishes. 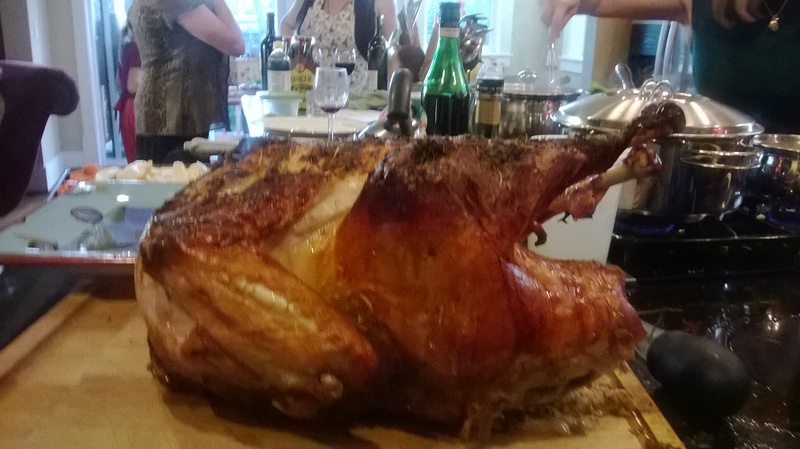 On something as large as a turkey, you can probably expect closer to 10 degrees, if not more. Carry over works by allowing the higher temperatures near the outside of the cooked food which were directly exposed to the heat source to…uhh…carry over into the cooler middle. The rest period also allows some of the steam to cool and return to water form, resulting in a more moist dish. I am reminded of a question on my differential equations exam in my early UW days: assume a turkey is a uniform 10 cm radius sphere with such-and-such thermal coefficient at such-and-such a temperature and there is an infinite plane oven at whatever other temperature; work out how long it takes until the coldest part of the “turkey” is above such and such a temperature. The “rest time” and latent heat due to the enthalpy of the steam was not a factor. You Americans with your processed food. Indeed. And how often do you baste the spherical turkey to achieve uniform crispiness? I say, put it on rollers and keep it constantly rolling in a pool of cooking juices. On a completely other holiday-food-related topic, in New Zealand we do not have Thanksgiving of course, but we celebrate Christmas. At least for pakehas like myself, our Christmas customs are imported directly from Europe, so we roast two or three different types of meat – often turkey – and serve with gravy and stuffing and hot vegetables. In the middle of summer. Then we lie in the sun complaining about how full we are, and how hot it is, and why didn’t we just have a cold salad or something. Then we try to drag ourselves over to the swimming pool and gently roll into it, trying to cool down and digest all the hot food. Also, we have our fireworks on Guy Fawke’s night, so we have to stay up until 10 when it gets dark enough. Someone needs to blow up the NZ parliament in the middle of winter. Funny. The two mathematicians/computer scientists I follow closely in the blogosphere post recipes/cooking help not infrequently. Very nice. I will take this advice to heart. Are the units specifically selected so everyone will have to convert at least a few? That’s the world I live in as a Canadian living in the United States. I don’t even notice I’m doing it. Liquid measures, distance measures and weather temperatures I do in my head, but since I never have to deal with high temperatures in Celcius these days I could not easily tell you what 325F was in Celcius; I’d have to do the math.